Rafael Devers went nuts at the plate on Tuesday, also putting the exclamation point on a wild Sea Dogs comeback. Devers hit his second and third home runs in two days, going 5 for 5 with four RBI and four runs scored. He blasted a three run shot to the opposite field in the fourth and hit the go-ahead solo shot to right-center in the sixth inning. Portland fell into an early 6-0 hole after Jacob Dahlstrand couldn't escape the first inning. But Devers and Danny Bethea, who went 3 for 5 with 2 RBI in his 2017 debut off the DL, led the comeback. Tzu-Wei Lin cooled off, going just 1 for 5. Williams Jerez and Ty Buttrey combined to shut out Hartford in the final 4 innings. The night started out promising for Salem, as Michael Chavis drove in his 14th and 15th RBI of the season on a two-run double. But that would be all of Salem's offense on the night and Dedgar Jimenez was shelled for seven runs (six earned) over four innings. Tate Matheny went 1 for 3 with a double and a run scored. The Drive were stymied at the plate on Tuesday, getting held to just two hits on the game. Jagger Rusconi provided one of those two hits, collecting his first triple of the season. Robby Sexton took the loss, allowing three runs on six hits in five innings of work. He struck out five and walked just one. Player of the Night: A career night for Rafael Devers makes him the easy pick for Player of the Night. Devers has now had a five-hit game at Low-A, High-A and Double-A and raised his average from .274 all the way to .324 with Tuesday's performance. 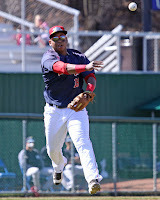 The newly minted number-one prospect on SoxProspects.com also has four home runs in his last four games.